A Polish court has overturned a ban on a nationalist march in Warsaw to mark 100 years of Poland’s independence. “We’re victorious,” said the organisers of the annual event, which has become a magnet for the far right and has been marked by violence in recent years. 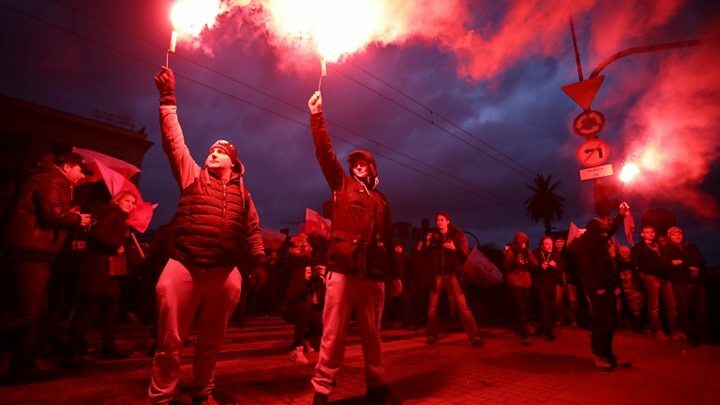 The ruling comes a day after Warsaw Mayor Hanna Gronkiewicz-Waltz barred the rally, saying the city had suffered enough from “aggressive nationalism”. After the ban, President Andrzej Duda vowed to organise an official march. “Everyone is invited, come only with red-and-white flags,” he said, referring to the march that was expected to follow the same route as the nationalist rally – only starting one hour later. The president warned that anyone carrying the kind of offensive banners seen last year would be dealt with by the police. Why are nationalist marches controversial? Although the yearly event is popular with thousands of ordinary, patriotic Poles, including supporters of the ruling Law and Justice (PiS) party, it is partly organised by the far-right National Radical Camp (ONR). Among the Polish flags last year were smoke bombs, along with racist and anti-Semitic chants and banners. Some of the marchers were far-right agitators from other countries including the UK and Italy. Ms Gronkiewicz-Waltz, a member of the opposition Civic Platform party, explained that security on Sunday was a concern and her appeals to the government for help had fallen on deaf ears.